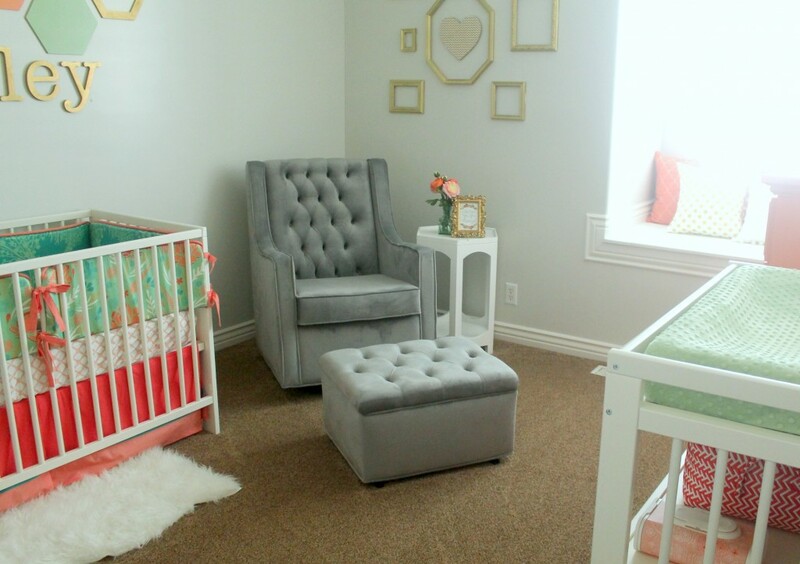 I am so excited to share our nursery makeover with you! This is what the room looked like when we moved in…. It definitely didn’t look baby friendly, but I knew it had potential! We used Sherwin-Williams Emerald Interior Acrylic Latex Paint in Frosty White for the walls and Sherwin-Williams Emerald Interior Acrylic Latex Paint in Pure White for our trim and ceiling. I love how light and bright it made the room! After we painted, we replaced the carpet. The carpet was almost 20 years old and pretty worn. You can read more about the carpet we selected here! After the carpet and paint were done, it was time to start decorating! I based the entire nursery around my gorgeous bedding from Modified Tot! I am obsessed! The owner, Holly, was absolutely amazing to work with! I told her a few colors I liked and she completely designed all of the bedding! She is so talented! You will die when you see her darling crib bedding collections, room accessories, and wall art. It is all so cute! You are going to love it! The bedding is also super high quality and she has a huge variety of gorgeous fabrics to choose from! The white crib is from Ikea. I wanted something white and simple, so this crib was perfect! The faux sheepskin rug is also from Ikea. 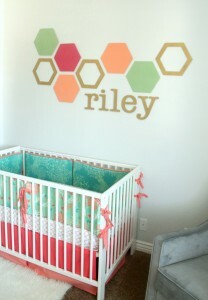 To add some color to the room, I added this cute hexagon wall art above the crib. You can read more about it here. 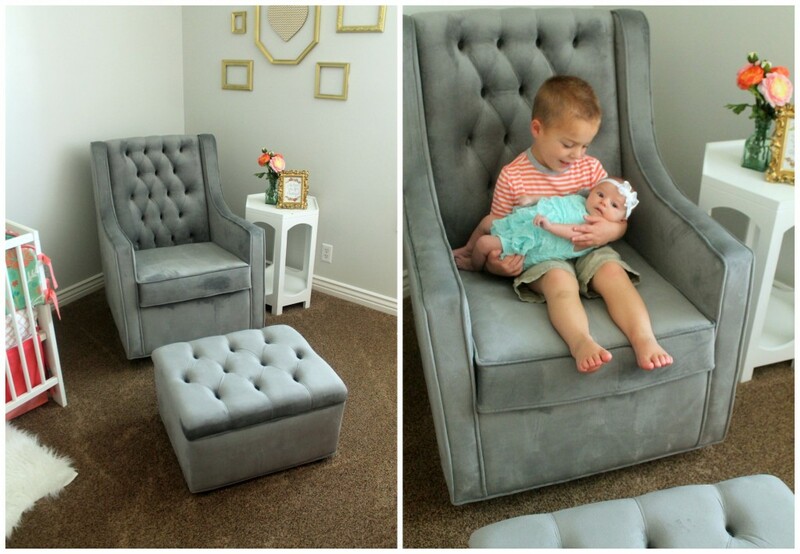 The most popular place in the nursery is definitely in this gorgeous glider from Bratt Decor! There is nothing better than rocking a sweet, new baby to sleep. Am I right?! You can read more about this chair and Bratt Decor here. This glider is so comfortable and so well made! They have a huge selection of other gliders and beautiful nursery furniture you will love! I got the small white table from HomeGoods a few years ago. The gold frame is from Pick Your Plum (which I spray painted gold) and the flowers and vase are from TaiPan Trading. 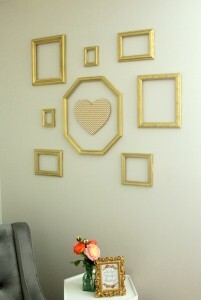 To fill in some space above the glider, I added a gold frame gallery wall. You can read more about it here. It was only $30 for the entire project! 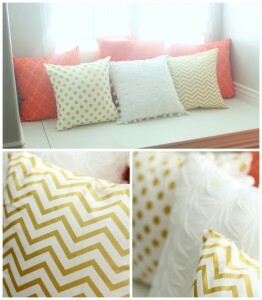 I wanted to have a few pillows in the window seat and LOVE these gold accent pillows from Sarita Lutrell! They are so gorgeous! She has a big selection of pillows that are all so cute and affordable! The coral pillows are from HomeGoods and Nordstrom Rack. The white pillow is from Target (no longer being sold). 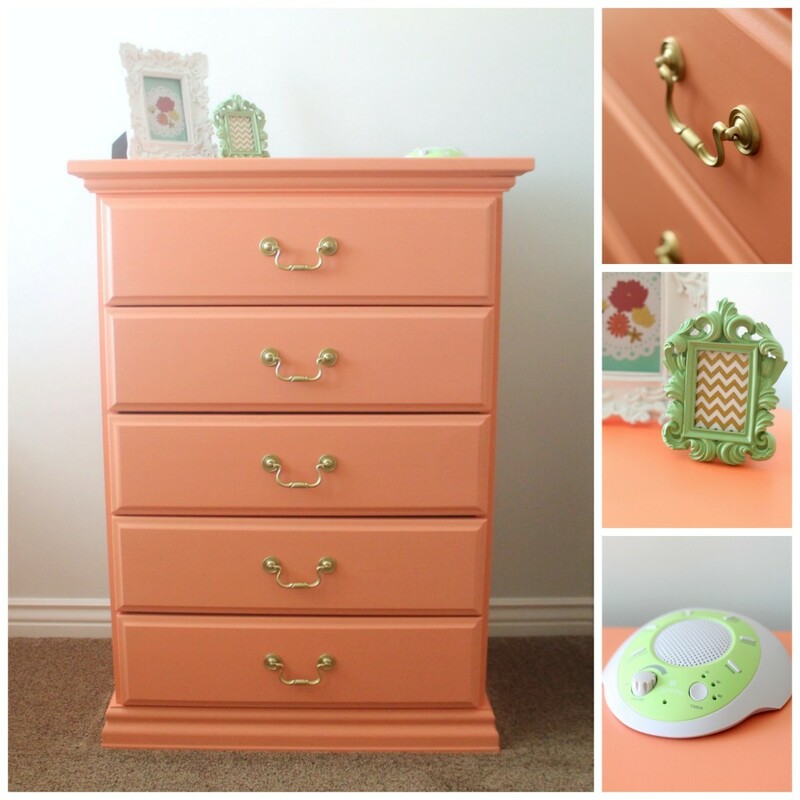 I had an old dresser from my son’s room that I refinished and painted a bright coral color. You can read more about how to paint furniture here. The white frame is from Ross and the green frame is from Pick Your Plum (which I spray painted). I know it isn’t the most fashionable thing, but that white noise machine is the best thing ever! My sisters’ kids are the best sleepers ever and she swears by using a white noise machine in their rooms. I didn’t use one for my first two kids and decided to give it a try this time around. My baby sleeps like a rock! Since she was four weeks old she has been sleeping through the entire night and for up to 12 hours straight! So if you are in the market, you will love this one! Best $20 I’ve ever spent! I love having a changing table. It is so convenient to have somewhere to change diapers so I’m not bending way over or changing them on the floor. This white changing table is from Ikea. The baskets are from Ross and Hobby Lobby. 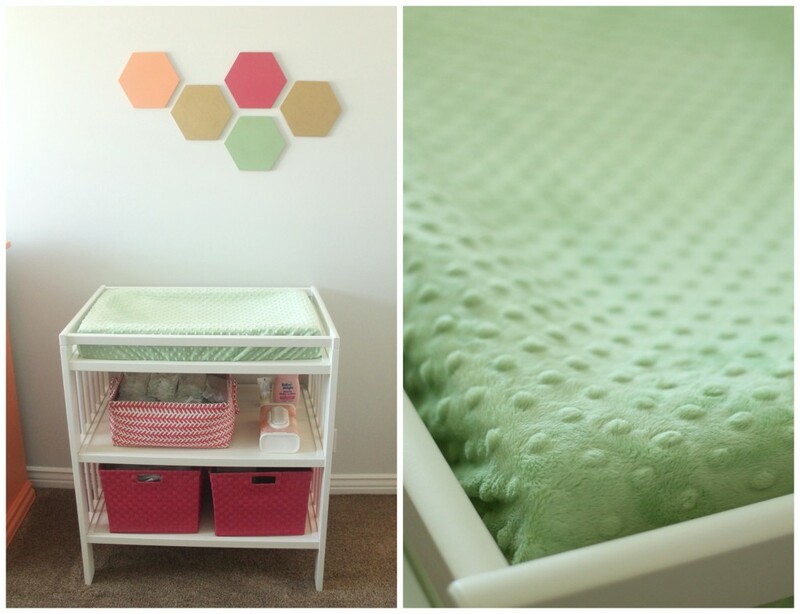 I love this soft, minky changing table cover from Little Owl’s Nest! It is machine washable and is made to last! They have so many colors of changing table covers, that you are bound to find one that is the perfect match for your nursery! They are also really affordable! The cute hexagons above the changing table are from GeometreeDesign and I painted them to match the colors of the crib bedding. I love the pops of gold! The hexagons are so cute too. I love it all! I love the bright colours and especially the painted dresser. I am working on a nursery for my first child right now and painted some old dressers for the baby's room as well. I also used a paint that did not require sanding called Chalk Paint and it worked amazing! Thanks for sharing! Love the nursery! Can you put another link to the white noise machine? We need one. The link doesn't work! Thanks !!! Love it! Sooooo cute!!! Could you please tell me where I can find the white noise machine, the link isn't working. Thanks! Hey Courtney! I am so sorry about that! The links should be working now, but you can find it here: http://tinyurl.com/lm39v6e. Thanks! I loved the way Riley's room has been maintained. Colors that you've managed for the room are really pleasing and won't be too strong for the baby. Sometimes people in the plan of making a decorative room, they try paints that will be too strong for the baby. Too bright colors are best to avoid for the new-born. Some colors are also bad for babies, because when bright light falls on them, they reflect too strong color. I appreciate your choice. I loved the frames too, I've actually have a similar idea of decoration executed by my elder son in our living room recently. He wanted a rack mount to be made using sheet metal and for his music system and was given for fabrication purpose at Bayview Metals ON. He with the help of workers in the fabrication session made few frames from the excess sheet metal. It has given a better look for the walls in our living room. This is sensational! And that dresser paint color is the perfect shade. What is it?! Love the color choices and all of the DIY projects! Awesome.